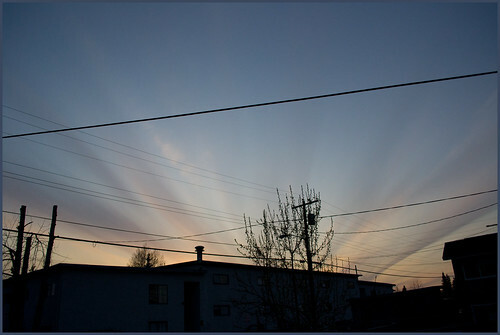 Strange cloud/sun ray patterning at sunset tonight. 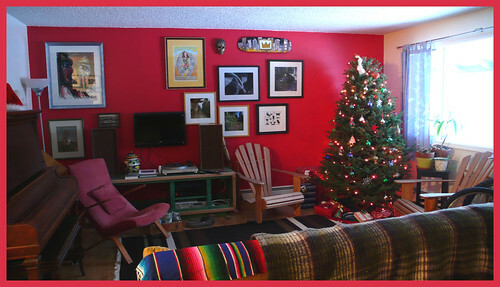 The nicest my living room has looked in over five years living in this house. I’m not over my pack rat-itis completely, but getting there. I can actually invite people inside now and not be embarrassed! Progress. After my mom’s untimely death in January and my stepfather’s less than eight months after, my job [I could not choose to accept it or not] became sorting out their house and affairs as executor of the estate. I spent 6 to 12 hours a day, every day except two from September 26 until the day before yesterday engaged in this work, at their house in Sequim, Washington. The past week was so busy I couldn’t even put up any blog posts! Nothing in my life experience prepared me for doing this. I had some help from my brother. It was the most emotionally charged, nerveracking and constantly challenging task I’ve ever faced. Maybe I’ve been lucky or had a charmed life. We had to go through the entire house and sort their belongings. In every closet, every drawer and cabinet there were items that made a stream of memories return [and some items I wasn’t familiar with]. We had to decide what to keep, what to sell and what to give away. A two-day estate sale took place [we had professional help with it, thankfully] where I got to watch the house get packed with people, sardine can-like… and was treated with high moments [compassion, respect and compliments from total strangers; conversations with concerned neighbors] and low [people rifling through tables and haggling over prices]. Managed to get through all of that, and completely empty out and clean the house, and did a fair job rehabbing my mom’s fabulous landscaped gardens including getting a fence built [wood posts and rails with split bamboo fabric covering] that she’d been planning. When I pulled out of there on Friday afternoon, the place was looking pretty good. The house is up for sale, and I am hoping that someone will buy it who is interested in continuing my mom’s vision. That might be a longshot, but one can dream. It is just a 1980s manufactured house, but they really made the most of it. I found a photo album chronicling my mom and stepfather’s history with this house, from finding it, forlorn and faded tan in a mobile home park, moving it to a big lot in the county off Old Olympic Hwy. and reinventing it in bold, new colors and site improvements. It was just five years ago that we designed and built a 400 sq. ft. deck, with built in planting containers across the whole front of the house, taking in a panorama of the Olympic Mountains. Such a sad business. I guess it’s a rite of passage.